I have been working on clearing up some side quests on a couple of my pirates lately and it gave me the idea for this post. I know many people don't bother with side quests, preferring to just concentrate on the main story. Here are the reasons (in no particular order) why I think this is a mistake. 1. Experience, experience, experience! This is one of the biggest reasons. I know many of the side quests, especially in the beginning worlds, don't seem like they offer much in the way of experience. However, every little bit helps push that experience bar to the next level. Being a higher level will allow you to learn new talents and powers, get better gear, train up companions to a higher level and get a better ship! As you progress through the game, especially once you get to Mooshu and higher worlds, you will be glad for all of these improvements to your stats, trust me! 2. 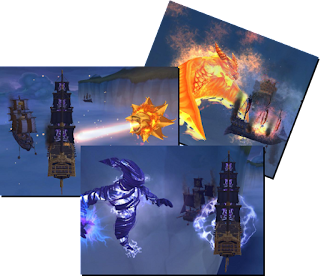 Nautical Experience - While a new ship is always awesome, outfitting it with higher level gear will make you almost unstoppable! Ships may have a level requirement, but all the ship equipment requires you to be at a specific nautical level to use it. And other than fighting ships, doing all those side quests is a great way to gain nautical experience. 3. Show me the money! Or.....Erm......Show your pirate the money! So many (maybe all) side quests give you gold. And pirates need A LOT of gold! From gear and ships to training up companions and pets, this game has so many features that require in game currency. Not only will you get gold as a reward for side quests, but you also get gold for defeating the enemies. Double bonus! 5. Expand your crew - And I don't mean just companions, although you can earn many companions from side quests. 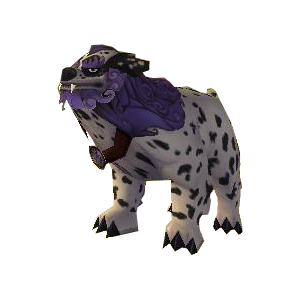 You can earn pets, as drops and as quest rewards, as well as unlocking companions in the crowns shop. You can even unlock the Pegasus mount by completing certain quests in Aquila! 6. Practice Points - This is mainly for the Prospector Zeke quests. By doing these quests (one for each world) you can earn practice points, which you can then trade in for new powers and talents. Powers and talents, might I add, that you wouldn't normally be able to train on your pirate. These are especially helpful for the new Mysterious Trainers that were just added in game. 7. Badges - Some people *cough* me *cough* like to collect the badges in game. If you're one of them, doing the side quests is a must. You can earn sooooo many badges for defeating bosses, completing quests, visiting certain areas, etc. You can even earn badges for completing every side quest in each book! 8. Farming - By doing side quests, you can open up new areas of the game that wouldn't be accessible otherwise. Actually, a few popular farming areas are available only as side quests (Moo Manchu and Pirate's Regatta anyone)? Who knows what you will be missing if you skip out on these. So many awesome drops!!!! 9. The stories - In my opinion, this is one of the main reasons to do the side quests. The game's writers have really put a lot of thought and time into the whole game, including the side stories. Some of my favorites are in Marleybone. There are pop culture references galore in many of the quests. Why would you want to miss out on that? 10. You get to play more Pirate101! And who wouldn't want to do that? I often hear people say that there is "nothing to do" in game. Well, it makes me wonder......have they all finished every single side quest in the game? I know some have, but I doubt everyone has. 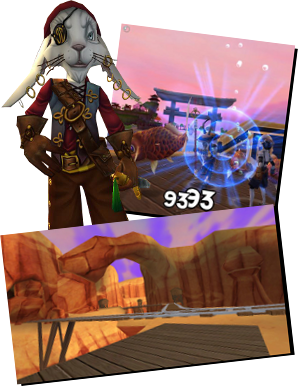 If you want to play Pirate101, log on and tackle some side quests. More swashing and voodooing and blowing stuff up! How could you not want to do that? And if you have done all of them, you can always grab a friend or three and do some farming! I really need to go finish the side quests in these areas. A map of where and who would be great. I don't know of any, but that is a great idea for a project! Thanks!! !